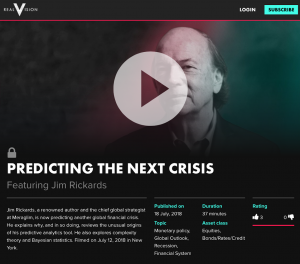 Jim Rickards, a renowned author and the chief global strategist at Meraglim™, is now predicting another global financial crisis. He explains why, and in so doing, reviews the unusual origins of his predictive analytics tool. He also explores complexity theory and Bayesian statistics. Filmed on July 12, 2018, in New York.